OH YES, I DID!!! 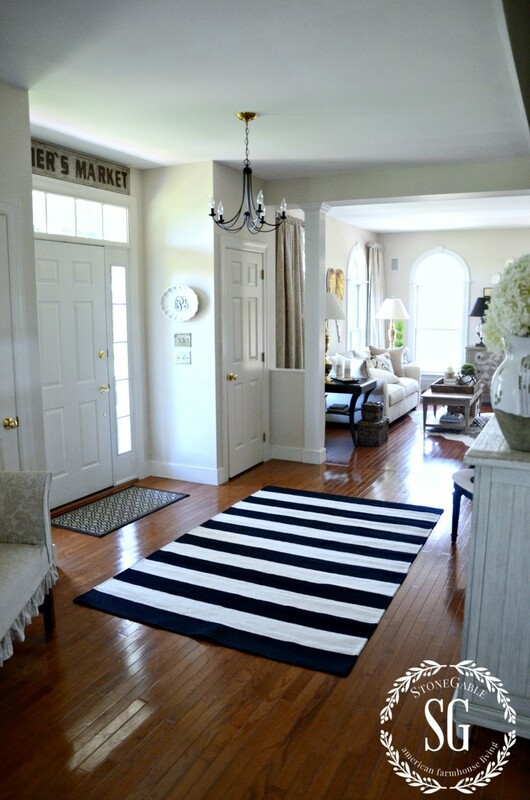 I recently replaced the traditional oriental rug in the foyer with a fun, modern, sassy, loud, black and white striped rug. I’ve said this before, but I think foyers are one of the hardest rooms in one’s home to decorate. My foyer certainly is a testament to that thought as it has been “evolving” for a couple of years! 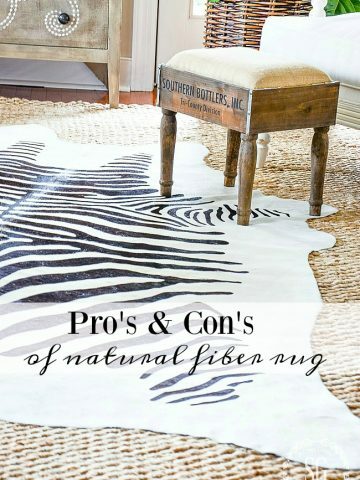 Some may think this rug is a bit too wild… but for me, it’s just the thing this room needs! StoneGable is a MODERN American farmhouse. I adore, love and swoon over the more authentic types. But, my farmhouse is updated and more modern with “touches” of real farmhouse charm. My look is Farmhouse…with a twist! A little classic, a little cottage, a little industrial and a big dose of ME! There was absolutely nothing wrong with the old rug. It had been in my living room and then in the foyer and now it will go in a bedroom upstairs. But I really needed little fresher look in the foyer. When I found this rug on Amazon for 77% off, I knew it was time to “go for it”! And boy I’m happy I did! I think my new sassy rug works better with the rugs in the living room and dining room. Here’s a very important thing to know about decor and life itself… EVERYTHING HAS A LIFECYCLE! Things change and get tired and worn out. That does not mean that they are not valuable anymore, but everything changes and so should we! Although my previous rug is still in good condition, it’s lifecycle in the foyer was ending. It will have a new fresh life upstairs! My new little rug works well with all the other neutral and black elements in the foyer! The little settee is going upstairs (did you notice I had it slipcovered?) and is being replaced by a really cool bench! I’m still so ambivalent about the foyer chandy (if you can call it that). I think I’m going to paint the original brass one I had and reinstall it. Oh, I don’t want to forget the little botanicals… they are going too! I’m not quite sure what I’ll replace them with but I’m looking! This fun rug (Amazon.com) added a whole lot of sassy personality to the room guest first come in to when I open my front door! I’d like to encourage you to GO AHEAD and change up something in your home that isn’t working! It doesn’t have to be a big or expensive change! Live with what YOU love! If you like this post please pin it to your HOME DECOR Pinterest board. You can follow me on Pinterest and see all the great things I am finding to pin HERE. Hi. Love all the decorating ideas! It all seems so perfect as if it has evolved over time. Certainly puts a smile on my face. Love your home. Thinking of painting our front door a color like on your door. May I ask what brand and color it is? Our paint color was a happy accident. We asked fo a soft gray and it must have been mixed wrong. And we love it! 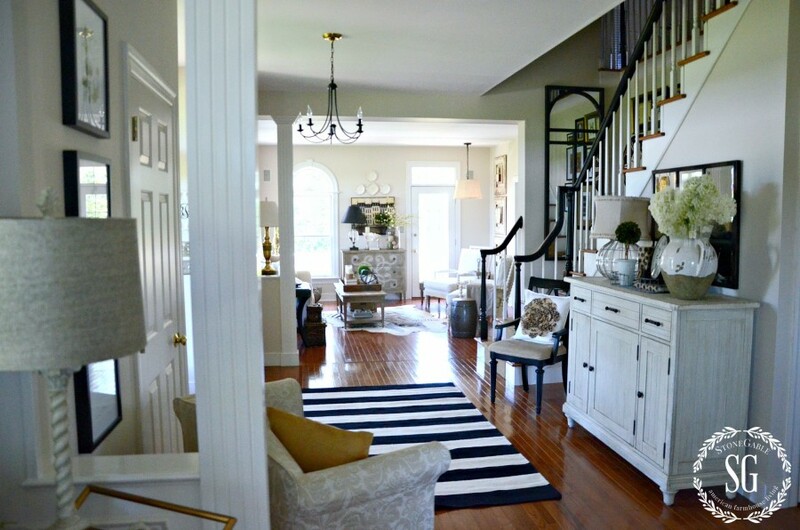 Yes, the striped rug is a better fit to the foyer. Great job mixing it together. Yvonne Of course I ♥♥♥ the rug. 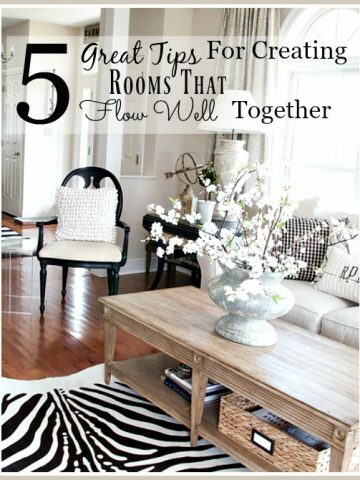 when I got my black and white striped rug for our family room, no one loved it but me and now I am not sure the room would be ME without it. It was the one touch that was totally me and me alone because no one else in the family was sure about it. I bet you smile every time you see it when you open your front door! I love your foyer table! where is it from? I need inspiration for my new house..and I also love classic, farmhouse and modern. Often times I feel like I can’t do all together! Hi Kristen, The buffet is from WAyfair. It looks even better in real life! LOVE, LOVE, LOVE! Would also love to have that rug but now it is back up to full price. How long ago did you purchase? What a great deal you got!! A little Southern “Sass” is a welcoming sight in your foyer, dear friend!!! I adore the changes that are taking place at Stone Gable!!! 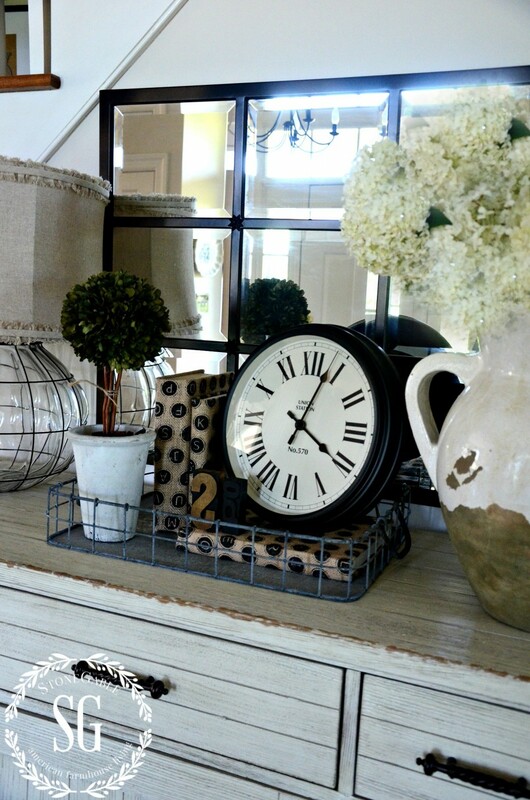 Timeless Classic Farmhouse Style. . .truly inspirational!!! 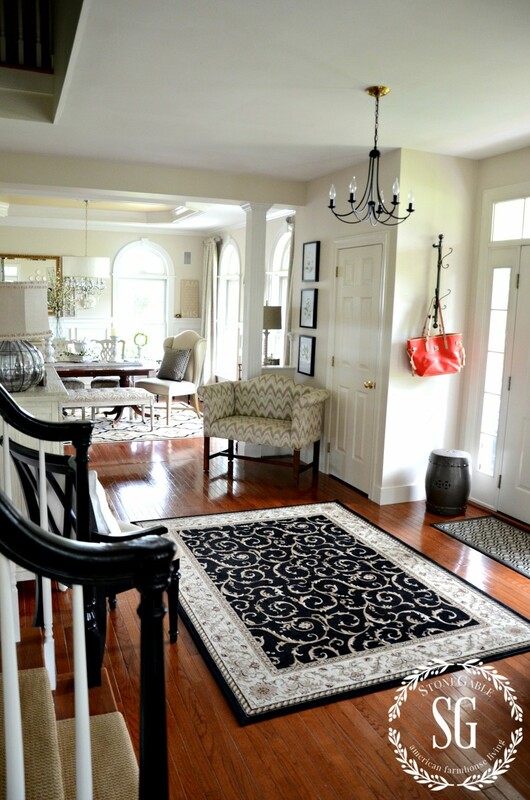 Love the boldness of the new rug in your entryway, it looks gorgeous. 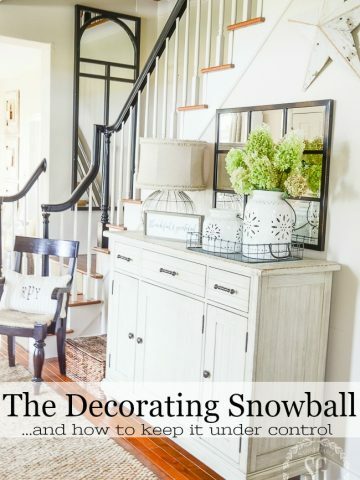 I love your blog and really love your decorating style and colors and how you put everything together Yvonne. You’re such an inspiration to us all. Thank you. I like the POP your new rug gives the foyer. It is eyecatching for all those coming in the front door. I’m actually glad you’re moving the little settee out because my next thought when looking at that photo was that you need something geomentric or “loud” on that settee instead of the current pillow. Keep up the good work! Hi Yvonne. LOVE everything you post!! I’d love to get this rug but it says 345.60 on Amazon. Seems like an aweful lot. Did you get a better price? Wouldn’t a big old lantern look cool in your entry? Much happier! The new rug has a very farmhouse Scandinavian look. I love it. (But now I feel your commode would look great in a wood tone instead of white.). Really this one change has transformed the entire look as did the DR rug. You did it again! I can’t believe how beautiful your home is and how you keep mixing it up to be even more beautiful. I never considered myself the farmhouse type, but you decorate in a way I love. You have a way of adding a welcoming and comforting twist to classic. Love our blog!!!! I need some sass in my life, thanks for the idea 🙂 Love it!! Love, love the rug there!….From the moment you enter the door, it makes a statement of just who lives there….a person with style and lots of “SASS” …. great deal on the rug. Looks wonderful in the foyer!!! Sweet! I love the sass! I agree with your rug selection. You are moving in a more contemporary direction and the rug is the perfect addition. I also agree the settee doesn’t quite fit the new direction. Can’t wait to see the new bench. Love your style – so warm & welcoming. 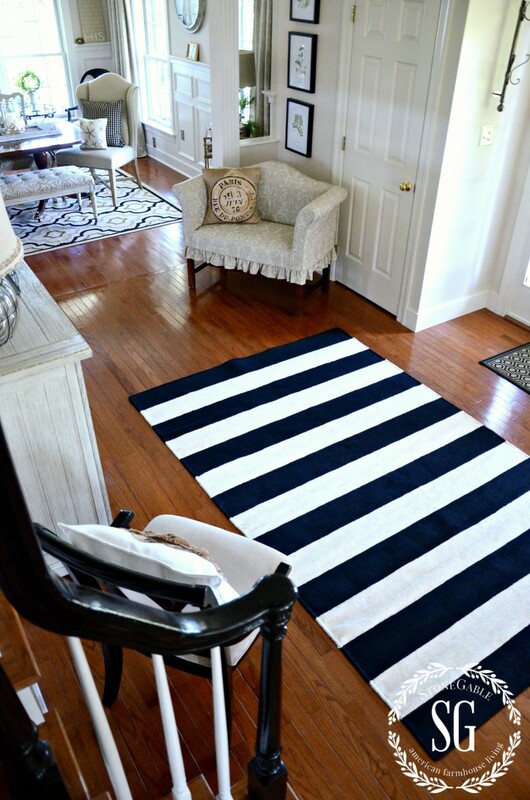 Your new striped rug looks beautiful in your foyer. And at a 77% reduction in price, I think it looks even beautiful-er! Y. love the rug. It compliments your foyer perfectly. I love the clean color of your walls. What color do you have on your walls? Hi Christine, our walls are a very neutral color… Sonnet by Benjamin Moore. 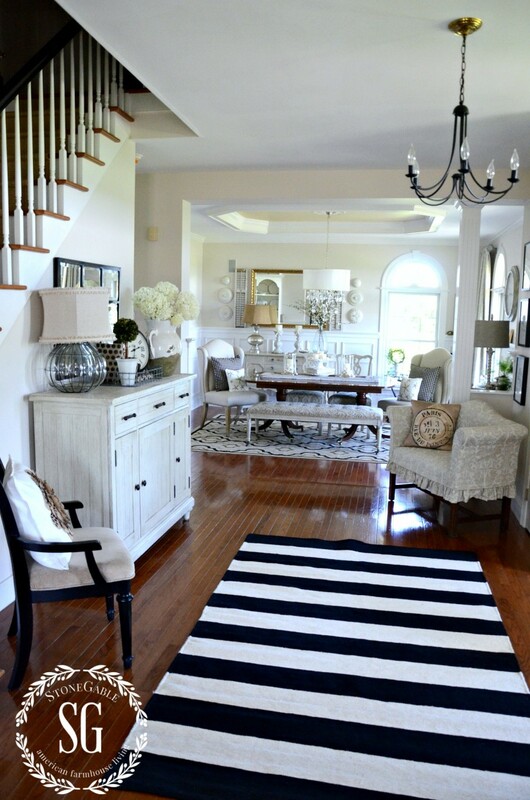 LOVE the striped rug, Yvonne!!! Well there you go again- waving your magic wand! You have such a flair for the unexpected, yet whatever you do, it always looks like it belongs. You are such an inspiration for creating such a lovely home and I enjoy all your encouragement! Whenever I see something you have done I think, “Now I can do THAT!”. Thanks for sharing your love of home and your gift! I like it ! Looks nice with the new rug you put in the dining room too ! The new rug looks stunning! I love it! Hi Yvonne, I waanted this same rug for my dining room but Amazon was out of the size I needed. I love it in your foyer! I am a new follower and your home is gorgeous. I love the new rug! Somehow I think you could have added a dirty old feed sack to your floor and made it look beautiful. You have such a great talent. Hi Pia! Welcome to the StoneGable family. Thanks for the sweet, sweet comment! It’s gorgeous, Yvonne. Really adds a punch to your entry. It is funny how our tastes evolve. I recently put a red and tan striped rug in our family room and I love it! I wouldn’t have thought of doing that, but I love it. It’s a wow! ee new rug looks great! I agree your previous rug looked good, but the new one does give it a sassy new feel. 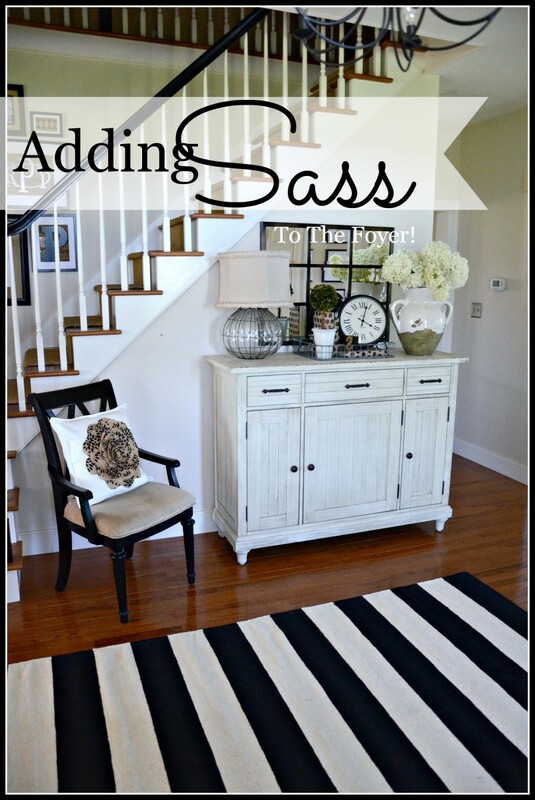 That rug is indeed a little bit sassy and I love it! I love how your style is evolving – so inspiring! Oh wow!!! I love that rug!!! I understand that I need change things up and honestly, just can’t stand my living room rug another moment. But I’m having so much trouble deciding what to do!!!! I need something that my cats won’t destroy and isn’t a fortune. My problem is I get “stuck” on a style and I’m not as brave as you are to mix it up!!! Thanks for nudging me to do something!!!! You always have the best ideas and advice!!!! The settee has always been there. The room needs something on that side. Without a soft furnishing the foyer looks empty and cavernous. Thanks for your input. I LOVE the new look! Modern and sassy, indeed. thank you for the great reminder to not be complacent with our styles. Congrats on the new look. some things around especially when you are in your house all the time. Can’t wait to see your new bench……….. The new rug looks so fresh and perky! Yes, SASSY! I get stuck in such a rut, thinking I’ve finished an area in my house. I need to take a new look and shack things up a bit! Thank you the inspiration. You have a beautiful home. Please come and redo my entire house! I just found your blog on Tuesday and I love it. Keep inspiring us!! Loving the rug! I love mixing modern, rustic and vintage – and that rug did just that for that space 🙂 Thank you for sharing. I just recently found your blog and have been studying your posts. I moved into a new build almost 3 months ago going from a 2000 sq ft to 6500, and I am majorly struggling getting this place to feel more than just pretty new walls. Thank you for your inspiration! Welcome to the StoneGable family. I love the rug and the color palette of your home. The only change I see as an outside observer is the height of the mirror. Have you thought about turning it vertical to heighten the vignette? Always enjoy your posts. Thank you. Yes, Danielle I know! But with the way the wall is cut off there is not much I can do about it! what is name and brand please!!! The brand is SURYA and the collection is Fronteir. It’s a 5 x 8 rug 100 % wool. Hope this helps. I think it looks fantastic! Makes it more airy and bright. I personally love stripes and contrasting white or light in a rug. The new rug is perfect! Looks great! Such a breath of fresh air!!! I know the conflict you experience when you retire a much loved and valued piece. I had cranberry and navy orientals and they actually were an investment, with an eye towards holding their value. Some were antiques and all were hand woven. I saved and shopped and saved and shopped. I even researched the reputation of the dealers to be sure I was getting what they were representing. THEN….I grew tired of that look! It was years, and they took me through my American Colonial, English, and even French periods. And they made many moves with us. My floors are still covered with orientals, but they are light colored, reversible Soumaks. This house is lmuch more of a mountain/lodge/French look and they look perfect, but those valuable rugs are in the attic and I’m promising myself that if I do not use them in my next house, that I’ll take them to a reputable dealer and sell them. I have a few of those investment rugs too. And the lesson I’ve learned is although they are GORGEOUS my taste changes. I’ll never make such a huge home investment again. A rug on sale for 77% off works for me!!! The new rug looks amazing and really makes a statement as soon as you enter your home. Changing one thing makes all the difference! The rug looks fabulous. A nice contemporary touch to a lovely entryway. I absolutely LOVE your new rug! It looks wonderful in your foyer – way to go! What a difference a rug makes…it’s like looking at an entirely different room. 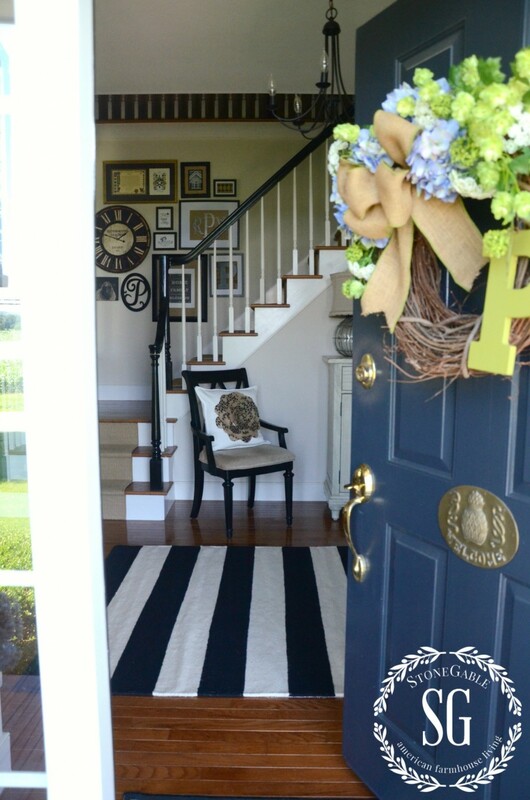 Your foyer is so welcoming…love it! Thank you for reminding us that everything has a lifecycle. I’m finding that lately as I make changes to my living room, dining room, kitchen and foyer which are all on the main level of my home. The hardwood floors will be a major change but as I walk through the space lately I find myself re-thinking the art on the walls, the beautiful trellis lace window treatments that I fell in love with 14 years ago must take a break or find a new location in my home. So grateful to have your blog in my life and you too! You inspire me every day to look at everything around me in a different way. Hi . . this is the first time I’ve commented on your site. . . but I have to say I really like the striped rug better than the other one. prise . . . . that is with in reason. And it gives that special something.